This week on ‘The Writing Life of:‘ I am thrilled to be interviewing author Siobhan Curham. Siobhan will be sharing with us detail of her writing life, telling us all about her latest book ‘Don’t Stop Thinking About Tomorrow‘, which was released on 2nd August 2018 and answering a few fun questions too. Siobhan Curham is an award-winning author, editorial consultant, motivational speaker and life coach. Her books for young adults are: Dear Dylan (winner of the Young Minds Book Award), Finding Cherokee Brown (shortlisted for Wirral Paperback of the Year), Finding Your Inner Cherokee, Shipwrecked and Dark of the Moon (currently being developed for television), True Face, The Moonlight Dreamers and the Moonlight Dreamers sequel, Tell it to the Moon. Her books for adults are: True Love Always, The Sweet Revenge of the Football Widows, The Scene Stealers and Antenatal & Postnatal Depression. I wanted to be a writer for as long as I can remember – apart from a brief phase when I was a little kid and wanted to be a cab driver! This was in large part down to my parents, who believed that TV was bad for a child’s imagination, so we never had a television in the house. I really resented them for this at the time but now I’m grateful, as it meant I spent loads of time reading – and through that, my love of writing was born. I loved the Narnia series. Reading The Lion, the Witch and the Wardrobe and feeling so immersed in that world taught me how powerful books could be. I was also a great fan of Little Women and the Little House on the Prairie series. And then, as a teen, I devoured anything by Judy Blume, who I think was probably the first ever ‘YA’ writer. I can remember one night, when I was about ten or eleven, lying in bed and gazing at my bookshelf and thinking how cool it would be to one day have a shelf of books that I had written. I’ve now written 25 books, which I have on a bookshelf at home. I call it my shelf of dreams and I look at it whenever I need a shot of self-belief, or a reminder that anything’s possible if you dare to dream. My path to becoming a writer was definitely a bumpy one. I went to uni to study English but once I got there my inner voice of fear started having a field day. I’d grown up on a council estate in London and everyone I met at uni came from much wealthier backgrounds than me. I started to feel as if I didn’t belong in that world and that I’d never make it as a writer, as I’d come to realise that publishing was a very middle class world too. So I dropped out and went to work for the complaints department of a frozen food company. Admittedly, my job did involve some writing – grovelling apology letters for the gross things people found in their ice-cream or frozen peas. It wasn’t exactly living the dream. Thankfully, that job was so bad it gave me the incentive to start writing again. This time, I approached writing like any other job – I started small, writing articles and short stories, and when I got some of them published I found the confidence to begin work on my first (non-fiction) book. When that was published I found the confidence to write my first novel and I’ve been writing ever since. Writing is my full-time job so I have to be pretty disciplined. I find that setting myself word count targets is really helpful. I’m usually working on two books at the same time, sometimes even three, so I tend to split my days in half and work on one book in the morning and one in the afternoon. I have actually written some books for young children under a pseudonym – I find pseudonyms a really fun aspect of being a writer. It’s like you can invent different writing personas for different age groups or genres. Hahaha! I love this question! Maybe not so much strange but I do have certain habits. I always fire up with a cup of vanilla coffee and I like to write to the sound of the ocean – not literally, sadly, but I’ve found a great eight hour video of ocean sounds on YouTube! Definitely on a computer – although I do like to plan in a notebook in longhand. I collect vintage typewriters and while I think they’re really beautiful, I’m so glad we’re now able to write on PCs and have the option to cut, paste and delete! I’ve written 25 books altogether, 14 under my own name. The others are all under pseudonyms or titles that I’ve ghost-written. Thank you for introducing me to the word ‘pantster’ – love it! I’m a bit of both really. I like to have a rough idea of where a book is going, but then so often once it gets going, it takes on a life of its own. I like to read the very first reviews, just to gage how the book is being received – and I will always read a review someone has tagged me in, but other than that, I’ve learned to detach. You’re never going to write something that will appeal to everyone and that’s OK. Constructive criticism can be really useful and help you to grow as a writer but it’s hard not to feel hurt or frustrated by the more mindless negative reviews, which is why I tend to avoid looking too hard for them. The seed for Don’t Stop Thinking About Tomorrow first came to me when I was giving some talks in the UAE as part of a book festival. During my talks I met hundreds of teens from all over the world and I was blown away by their desire to make positive change. I came away with the urge to write a novel for young adults that reflected some of the issues going on in the world today. Two issues that had really been troubling me were the Syrian refugee crisis and the number of people in the UK living in poverty. It took three years for the first seed of the idea to grow into a published book. Hafiz is named after one of my favourite poets and Stevie is named after one of my favourite musicians, Stevie Nicks. Hafiz is a teenage Syrian refugee who has ended up in the UK. He has been traumatised by what he’s witnessed on the refugee trail and his fears for his loved ones and family members back home in the war zone. The one thing that gets him through and gives him a desire to make something of his life is his passion for football. I based his character on the real-life story of a very talented teenage footballer from Syria who was unable to play the game for several years while on the refugee trail. It really brought it home to me how much refugees have to sacrifice, on top of leaving their homes and their families. Stevie is a teenage carer for her mum and they are living in poverty. The thing that gets her through the hard times is her passion for music – both listening to her dad’s old record collection and playing her guitar and singing. When she and Hafiz become friends they encourage each other to follow their dreams and triumph over adversity. The scene where Hafiz confronts his fear of the sea – a fear which had been caused by a terrifying incident when a boat he was travelling on as a refugee capsized. Once again, I used real-life accounts to draw upon and I wrote those scenes with tears streaming down my face. When you read about the hardships refugees face it makes the hostility towards them from certain sections of society and the media even harder to stomach. It’s taken from a Fleetwood Mac song that features quite prominently in the book – and also captures the theme of the story and the importance of never giving up hope. The song is a bit of an earworm though so I’ve had to apologise to readers and reviewers who have ended up singing it for days while reading the novel! If it’s any consolation, I’ve now been singing it every day for years! No, the first person who saw it was my editor. I was lucky in that I was offered a book deal by my publisher before writing the book, as I’d had other books published by them. I’m very aware that this really is living the writing dream and hugely grateful for it. I can remember only too well how nerve-wracking it is when you have to write something on spec. In fact, I’m doing that right now, as I write my first novel for adults in years with no guarantee of a book deal at the end of it. To anyone reading this in this situation I would urge you to keep the faith and keep writing. Even if you don’t end up getting a book deal, you can always self-publish. I have a routine that dates back eighteen years to my very first book. As I typed the words THE END, the song Holiday by Madonna came on the radio and I got up and danced around the room for joy. I’ve done the same thing with every book ever since. It’s such a sweet feeling and so important to celebrate in some way. I’m about to start work on a new YA novel about the friendship between a poet and a street artist and I have a non-fiction book for adults coming out in Feb 2019, called Something More … a Spiritual Misfit’s Search for Meaning. I spent seven years living and writing Something More, as it’s part-memoir, so I’m very excited / nervous to share it with the world! A film called The Way, starring Martin Sheen. You can find out more about Siobhan Curham by visiting the website/social media sites below. I would like to say a big thank you to Siobhan Curham for sharing with us details of her writing life, and for a wonderful interview. I was a huge fan of both Narnia, and Judy Blume books when I was younger too. Don’t Stop Thinking About Tomorrow sounds interesting. It’s an amazing book, I reviewed it last month. She seems like an interesting person. Her books must be good. I’ve read two of her books and they have both been amazing. I also have a third here that I need to get around to reading. I totally enjoyed this interview. It got me thinking about the availability of YA books in the 80’s (when I wanted the transition into older books) there were none. I also loved Little Women when I was young (and still do.) 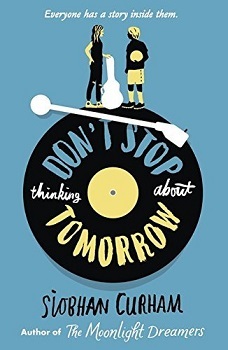 The title for the book is wonderful, Don’t Stop Thinking About Tomorrow. (I saw Fleetwood Mac in 1990 ) I always enjoy your wonderful questions. I don’t ever remember reading the book. I’ve watched the movie and also the series that was on when I was a child. She listed almost all of my favorite childhood books! Great taste! Judy Blume was a favourite of mine growing up too. I love your interviews – always learning something new about an author. I love the “Shelf of Dreams” what a way to remind yourself of what you want and the struggle it took to get there. I think it’s a great idea too. This was a really good interview, and the book sounds interesting. Thank you. The book is amazing. Great post! I really enjoy your interviews! Thank you. I’m so glad that you liked it.